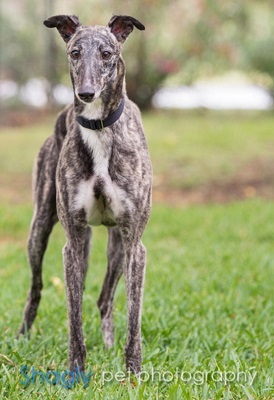 Allie, aka CTW Alhambra, is a 4 1/2 year old beautiful dark brindle female born September 12, 2012. Her sire is CTW Countn Money and her dam is CTW Pop A Wheely. Allie was quite the racer with 126 races to her credit on Greyhound-Data.org, most of which were at Wheeling, West Virginia, before moving and finishing her career at Birmingham, AL. Allie is ready to find her forever couch and family. Allie is living in a foster home with cats and a small dog. 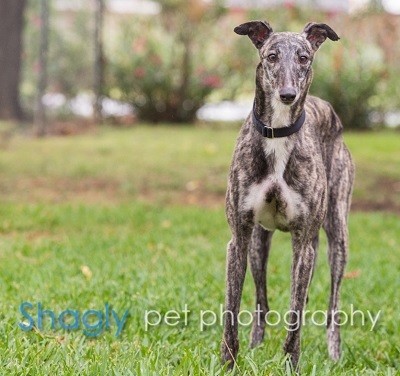 Allie has had quite the racing career, so no wonder she's ready to retire and find her forever couch. She raced 126 times, and placed in 45 out of her 126 races. Despite her amazing career as an athlete, she lives with a cat and is good with small dogs.